The Journal of Operations Management publishes scholarly research papers in the field of operations management and encourages new ideas on existing research. 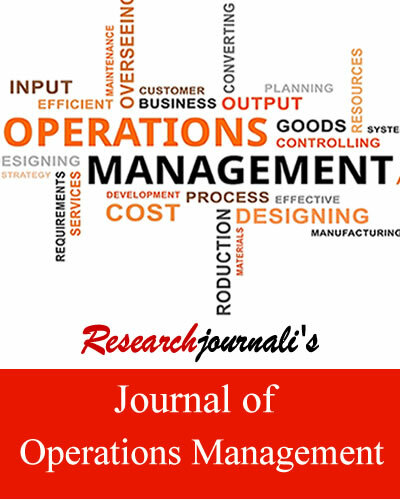 The journal aims to promote the significance of operations management. Researchjournali's Journal Of Operations Management (RJOOM) publishes scholarly research papers in the field of operations management and encourages new ideas on existing research. The journal aims to promote the significance of operations management and provide a forum for researchers across the world. The journal targets audiences including universities, colleges, organizations, professors and researchers. You submit paper online and get acknowledgment with article id soon after submission. You receive editorial decision within 7-14 days of sending research paper. You publish your 3rd research paper FREE with us and valid only for corresponding author. You retain copyright of your research work and only give the license to publish. You just pay for publication and no extra charges for article processing and additional authors. You can share published paper in social networking sites directly from website.